The accelerated inbreeding between documentary and drama on screen may be energizing both creatively, but can also be a mixed blessing. The snooze inducing traditional talking heads documentary format, despite its value as a singular source of alternative news and information, has certainly been enlivened by injected fictionalization. But the downside is that filmmakers of both drama and documentary often claim an ethically questionable right to bend the facts and influence public opinion, in far greater excess than even the errant commercial media. On the other hand, a movie like Battle In Seattle is so reticent about treading into subjective territory, that despite sympathy for selective characters who are political players in a catastrophic historical event, one can come away with hardly a clue about other than a factual procession of dramatized events. And without any side of the audience particularly able to feel comfort in their own personal moral victory. 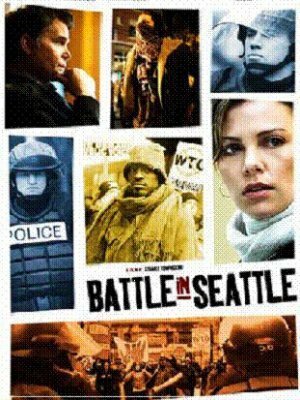 The directing debut of Irish actor Stuart Townsend, Battle In Seattle plays out like a frantically paced, multiple perspective news report about those massive street protests against the World Trade Organization conference taking place in late 1999. As students, anarchists, labor organizations and community groups squared off against police and the National Guard in often violent confrontations, over five hundred protesters were arrested and nearly one hundred hospitalized. Caught in the bitter clash are Ray Liotta as the perplexed mayor, Woody Harrelson as an overzealous cop, and Charlize Theron as Harrelson’s astonishingly oblivious pregnant wife just out doing the Christmas shopping downtown while havoc reigns in the streets. There are also somewhat distracting interludes focusing a little too melodramatically on the personal lives and public anti-globalization passions of some of the young demonstrators, including those played by Michelle Rodriguez and Andre Benjamin. Battle In Seattle is adept at fleshing out the many opposing points of view that eventually lead to an out of control city under siege. But with mutual understanding carefully laid out for all sides except the WTO, and a rather naive call for human kindness over profits, as if mere words can change the world, Battle In Seattle is skilled at creating the stage for percolating political passions. But the film doesn’t provide any particular path towards a glimmer of historical insights and resolutions.